Raise your right hand if you deserve a little self-indulgence! There is no reason to wait for your significant other to put a diamond ring on your finger… celebrate your independence and do it yourself. You work hard, take care of everyone around you and, now, you deserve to show off with a little ‘right hand bling.’ Every time you look down at your embellished right hand you’ll feel the satisfaction of knowing you’ve done something just for you! The world’s largest diamond producer, DeBeers, has promoted this sentiment with a tagline like “Your left hand lives for love, Your right hand lives for the moment” and “Your left hand declares your commitment, Your right hand is a declaration of your independence.” Although this may just seem like great marketing, we’ve seen an increasing number of women eager to adorn their right hand because they simply feel they deserve it! 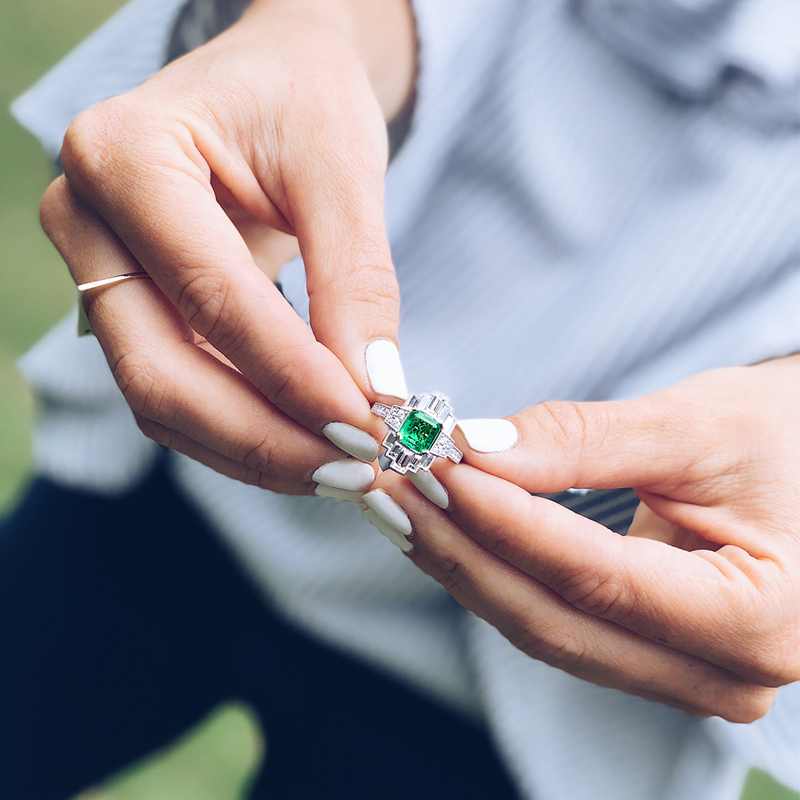 Many get so excited about this gift of self-love they opt to custom design a ring to perfectly reflect their personality, a process Ascot Diamonds specializes in. The trend towards right hand rings has become increasingly popular as divorced women looked for options other than banishing their old engagement rings to the bottom of their jewelry boxes. Instead, clients like Coca-Cola Worldwide Media & Communications Director Sarah A. brought in her rings and turned them into a new memory symbolizing her new-found freedom and independence. 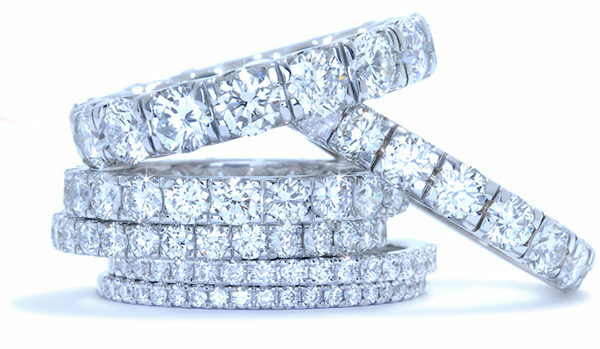 After all, just because you’re single or divorced shouldn’t mean that you don’t get to wear a diamond ring, right?! With gold and diamond prices on the rise there has never been a better time to resurrect those rings, re-use some of your existing gemstones, let us refine the metal and emerge with something fresh in celebration of you. Of course, right hand rings aren’t reserved for only the single ladies out there… they are also great gifts to symbolize the love, appreciation and respect you have for your significant other. So what are some of the most popular ideas for right hand rings? 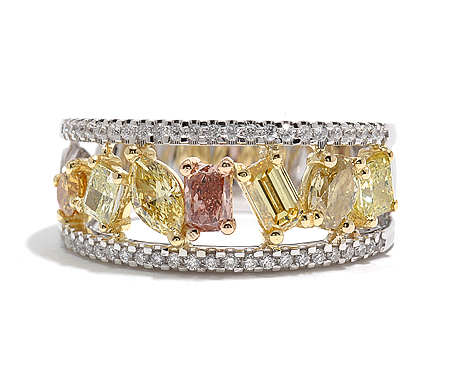 Colored diamonds in canary yellow, champagne, pale pink or deep black are among the most appealing as color easily expresses personality. 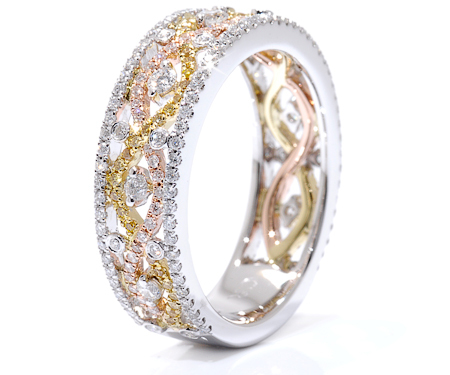 Many choose an ornate, diamond encrusted center band they can stack with black, yellow or pink diamond bands depending on their mood. In this way they become a gift that keeps on giving as they add on over the years. Of course we sell plenty of these more classic styles as well. There is a right hand ring for everyone. Browse our collection to get your creative juices flowing. Better yet, come see us in New York, Dallas, D.C. or Atlanta and we can help you design a custom ring for you and generations to enjoy!